Solo show less than 2 weeks away! My show opening for my one-woman show is coming up in less than 2 weeks. Custom Pet Linocuts – You know you want one! Ever want a great piece of fine art in the likeness of your favorite pooch, cat or chinchilla? 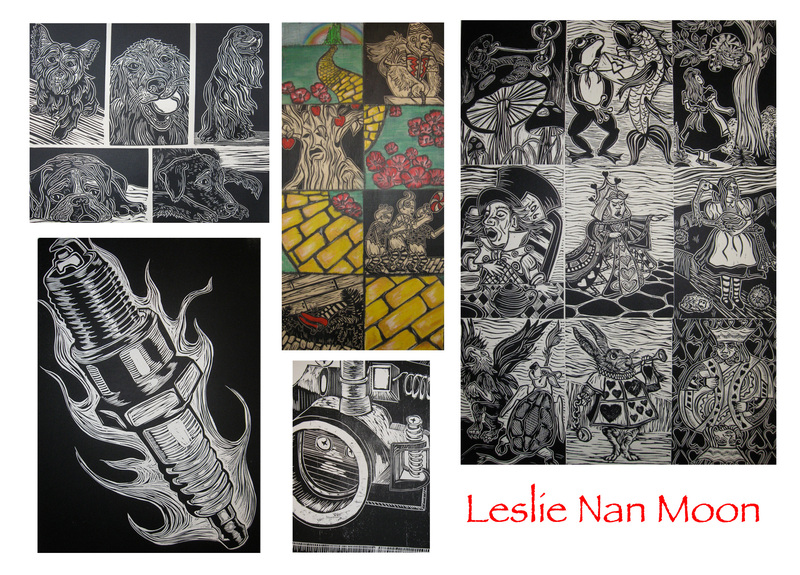 I’ve been printmaking for over 20 years and I just love to carve linoleum! My work has recently been published in Somerset Studio Magazine and I will also be in the upcoming edition of 425 Magazine. Now I want to turn YOUR pet into a beautiful print! I start with a photograph of the pet (I ask that you provide me with 2-3 images of which I will let you know what will work best), draw their likeness onto battleship linoleum, carve it out and then print on 100% cotton, acid-free, printmaking paper. Cost for a custom pet linocut is $50.00. Image size is 4″x6″. Included is a black 8″x10″ mat board with backing board. You will receive 2 matted prints with your custom pet print purchase. Additional prints available at $10 each. Dogs! My parents have had 13 (not mentioning the ones I’ve had on my own) since I was born so I started a project doing a linocut for each of the Stein pooches… from Loki to Morgan! I’m having such a blast doing them and yesterday I did my first “non-family” commissioned dog linocut. It’s of Molly who is the beautiful dog of a friend of mine back from when I went to summer camp as a child (special thanks to FB for making it so easy to find old friends!) Anyone interested in having their dog’s likeness turned into a piece of fine art can contact me at: moonriders@comcast.net. I’ll be starting up my Etsy page again shortly. With 3 shows coming up I’ve been a bit busy with those so the Etsy site was put on the back burner. You are currently browsing the Lesliemoon's Blog blog archives for March, 2010.